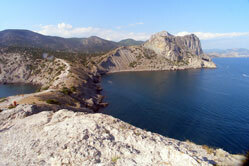 The southern coast of the Crimean peninsula has been the focus of intense maritime activity for nearly three millennia. From the earliest historical references to Greek colonization of the Crimean coast in the 8th century BC, Crimea has been home to numerous cultures: ancient Greeks, Scythians, Byzantines, Goths, Genoese, Turks, Russians, and Ukrainians, among others. The evidence for Bronze Age Mediterranean seafarers in the Black Sea is not limited to mythology. Mycenaean anchors and oxide-shaped copper ingots have been found off the western coast of the Black Sea. In order to better exploit the resources of the region, trade centers were established by several Greek cities along the Black Sea littoral. Ionian and Dorian Greeks began to colonize the coast in the sixth cent., and the peninsula became the major source of wheat for ancient Greece. Colonization generated a dramatic increase in maritime activity, both for trade and communication. Despite major disruptions in the interior, Crimea persisted as a center for trade between the Mediterranean and Eurasian steppe for more than 2000 years due to its favorable geographical location. Both the ancient Greeks and Romans relied heavily on grain, fish, salt, and other resources from the Black Sea hinterland to satisfy the needs of their large urban populations. In exchange, oil, wine, and finished products were imported for consumption by the colonists and native population. These bulk food products were carried in amphorae, two-handled transport jars. Conditions in the Black Sea, however, offer the potential for excellent preservation of cargoes. The sea bottom along the Crimean shore is primarily composed of silty clay deposits. Organic preservation in this matrix is known to be exceptionally high. The navigational and geographic hazards mentioned above undoubtedly contributed to numerous shipwrecks along the Black Sea coast; records from the historic period document hundreds of shipwrecks. Combined with the crucial role of the Black Sea in maritime history, these factors offer a high potential for significant discoveries. The economic importance of the Black Sea grew during the early medieval period as a result of the Arab invasions of the eastern Mediterranean in the seventh century. To avoid the hazards of piracy and war in the Mediterranean, the lucrative trade between Europe and the Near East was redirected through the Black Sea and the land and riverine trade routes of Eastern Europe. The enormous wealth generated by this commerce attracted the attention of newcomers to the Black Sea region - Scandinavian merchant-mercenaries. The commercial interests of these merchant-mercenaries were integral in the early development of the Russ state. Byzantine, Russ and Arabic sources document the extensive commercial and military activity of the Russ throughout the northern Black Sea region. Competition for access to the commercial wealth of the Black Sea quickly brought the Russ and Byzantines into conflict. Several seaborne attacks were launched by the Russ across the Black Sea against Constantinople. During the reign of Emperor Justinian (527-565) a major effort was undertaken to improve the fortifications throughout Byzantine areas of Crimea. The Empire was also facing war throughout the Mediterranean from Spain and North Africa to Italy and Syria as well as in the Balkans. But Crimea was so important that resources had to be allocated for its defense as well. At this point the Bulgarian horde controlled a large part of north and central Crimea. But Chersonesus was in Byzantine hands and Bosporus was independent. While early Rus-Byzantine relations were essentially military and commercial in nature, they eventually expanded into the cultural sphere as well, as reflected in the Byzantine influence on Russ architecture as well as the Russ conversion to Christianity in AD 988. These ties secured continuous trade relations between the two states until the fall of Kiev in the mid-13th century. As in antiquity, a lively trade between the Mediterranean and Black Sea continued through the Middle Ages, as demonstrated by finds of cargo amphorae in Crimea. In addition, locally manufactured amphorae and trade goods were being shipped abroad from Crimea. 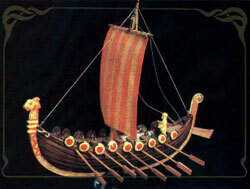 The Black Sea remained a center of maritime trade in the 13th century. Italian merchants, primarily Genoese and Venetian traders, continued a lucrative trade in luxury goods from the Near East, as well as agricultural goods and slaves from the Eurasian steppe. The Italian trading centers in Crimea thrived on this trade and became quite prosperous. For example, the Genoese colony at Kaffa in Crimea became so prosperous through Black Sea trade that it rivaled Genoa itself in wealth. Some of the hundreds of Italian ships that carried this trade invariably were lost along the Crimean coast through shipwreck. At the end of the 13th century the Genoese were expanding their influence along the Crimean coast from their initial bases at Kaffa and Sogdia (Sudak) and found several sheltered bays to be ideal as a trading posts. 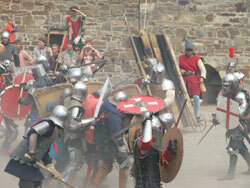 The fortress Sudak has had a long and varied history. During the centuries it has been known by several names; Soldai, Sugdei, Sugdag, Surozh, and Sudak are the most common. The first written record of a fortress on the site dates from 212 AD. The economic fortune of Sudak depended not only on the productive skill of the local people, but also in great measure on major changes in world-wide trade patterns generated by events far from Crimea. These events also affected its political future. Political conflict among Sudaks powerful immediate neighbors was an even more significant factor. The Genoese merchants remained in Crimea until the last quarter of the 15th century, some 20 years after the fall of Constantinople. The departure of the last European merchants did not mean the end of seafaring in the black sea, however. Kaffa remained an important center for the slave trade during the Tatar and later ottoman occupations of Crimea. Ukrainian Cossacks launched several seaborne attacks on ottoman ports throughout the black sea during the late-16th and 17th centuries. Their disruption of black sea trade was a source of major concern for the ottomans. While Greeks and other Europeans continued to live in Crimea throughout the period of Ottoman occupation, European traders no longer played an active role in Black Sea seafaring. The Black Sea became an Ottoman lake and knowledge of the region among Europeans began to fade. After Timurs destruction of the Golden Horde, the Tatars established (1475) an independent khanate in Northern and central Crimea. In the late 15th cent. both the Khanate and the southern coastal towns were conquered by the Ottoman Empire; the Turks called the peninsula Crimea. Although they became Turkish vassals, the Crimean Tatars were powerful rulers who became the scourge of Ukraine and Poland, exacted tribute from the Russian czars, and raided Moscow as late as 1572. This brief survey of the history of seafaring in the northern Black Sea illustrates the great potential for underwater archaeology in the region. Wind and current patterns, as well as a central geographic position, make Crimea an ideal location to search for shipwrecks. Maritime trade routes have crossed Crimea since antiquity. For more than 2000 years, ships of every design have sailed along the peninsula; many of these voyages ended disastrously in shipwreck. These ancient tragedies have left a remarkable, and largely untapped, archaeological resource. 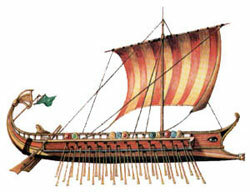 The discovery and recovery of a shipwreck may provide insight and information on important historical events in the Black Sea during the Ancient times and Middle Ages, on patterns of trade and relations between Europe and Asia from ancient times, on ship design, materials, construction and performance.